Three Kachin political parties and community leader Rev. Hkalam Samson immediately issued a statement of their own to insist that China’s claims were false and misleading. 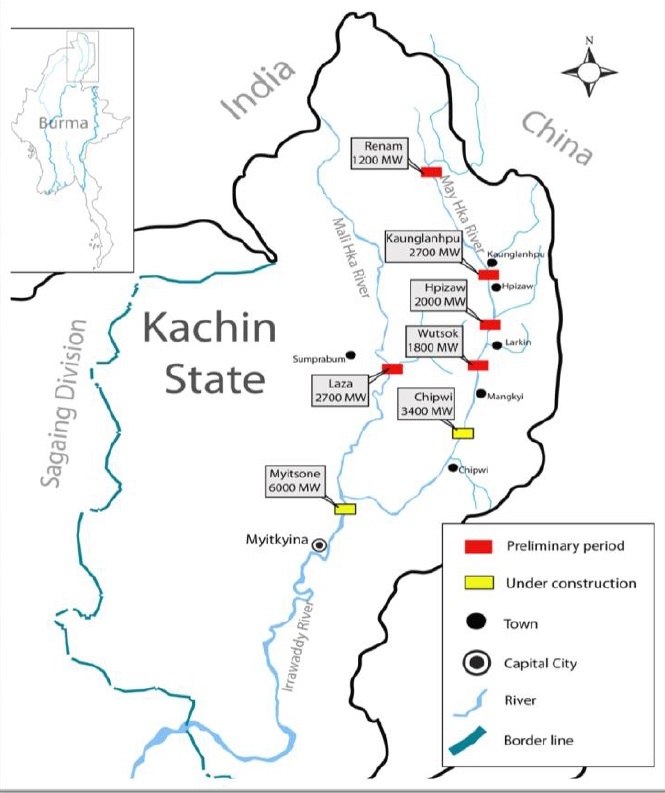 It is obvious that the people of Myanmar, and the Kachin in particular, have been opposed to the Myitsone dam projects even before it forced thousands of Kachin villagers to relocate. Myitsone is hardly China’s only planned dam in Myanmar. It also hopes to build dams in Lasa on the Mali River and in Khaunglanghpu, Phizaw, Lakin and Pashe on the Nmai River. A dam on the Nmai in Chiphwi is already finished. The people of Myanmar are strongly opposed to the seven dams on the Irrawaddy and its tributaries because of the irreparable environmental damage they may cause, the potential for water shortages and unpredictable surges, and the knock-on social and economic damage facing the millions who depend on the waterways. The sudden flurry of activity over the Myitsone begs the question: Why is China so keen to revive the project? First, China wants to push the project forward in order to help meet the power demands of its ambitious Belt and Road Initiative (BRI). As noted in the embassy’s statement, China is planning to establish three “economic cooperation zones” on its borders with Kachin and Shan state as part of the BRI. Moreover, China is expanding road and rail links with the country as part of the China-Myanmar Economic Corridor (CMEC). It is also speeding up construction of an industrial park in Namjim, in northern Kachin. The Myitsone dam would go far in providing them all with a ready supply of electricity. Second, with bilateral relations on the upswing, China wants to seize the moment. There is a saying: “Strike while the iron is hot.” In a recent column, I wrote that State Counselor Daw Aung San Suu Kyi could make a bargaining chip of the steering committee she has just formed to coordinate BRI projects. China, on the other hand, is using its support for Myanmar in the face of mounding international pressure over the Rohingya crisis to try to revive the Myitsone project and push forward with others. Beijing also promised to strengthen cooperation with the Myanmar military, or Tatmadaw, improve border management and control, and maintain border stability when Vice Senior General Soe Win paid an official visit to China in mid-November. China always protects Myanmar from scrutiny or punishment at the UN Security Council in accordance with its “paukphaw” brotherhood. It appears that China wants to seize this moment to restart the dams, while Daw Aung San Suu Kyi and the Tatmadaw need its help. Third, China may be trying to draw attention to the Myitsone dam to distract from other investment opportunities it is pursuing. For example, Myanmar Yang Tse Copper, a subsidiary of Beijing-based Wanbao Mining, has reportedly sought permission to carry out ground inspections for a possible copper mine in a 100,000-acre area in Monywa, in Sagaing Region. China is also continuing to pursue the Kyaukphyu Special Economic Zone in Rakhine State despite warnings in Myanmar that it could pose a debt trap for the country. While implementing the CMEC, China may also have to confiscate land from locals and come in for complaints of paying insufficient compensation, as it did when it built the Shwe gas pipeline connecting Rakhine and China’s Yunnan Province. Fourth, China wants to reduce its dependence on coal for its electricity supply. 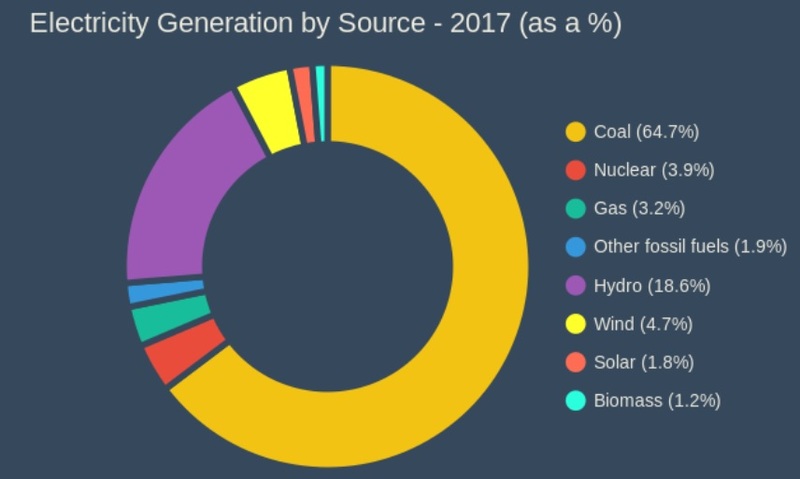 As the figures below show, China currently gets 64.7 percent of its electricity from coal and only 18.6 percent from hydropower. China is the world’s second largest coal importer after Japan. Its coal imports hit a record high in the summer of 2018. However, China is aware of the importance of reducing its dependence on coal, having faced protests by miners, average citizens and environmental activists both at home and abroad. For example, thousands of coal miners protested in China over unpaid wages in 2016 and thousands of locals have protested against coal mining in the Letpadaung region of Sagaing in recent years. China will never give up on the Myitsone dam. It is currently building dams on the Namtu and Nam Teng rivers despite local opposition. China may have yet more reasons for wanting to revive the Myitsone dam project than the ones listed here. Whatever they are, the people of Kachin State should not be made the scapegoats. Joe Kumbun is the pseudonym of an analyst based in Kachin State.